" The staff showed my son all the tools, explained how it would feel, and they had him happy and laughing the whole time! Very happy with the care." Jessica S.
"The staff showed my son all the tools, explained how it would feel, and they had him happy and laughing the whole time! Very happy with the care." Jessica S.
Healthy teeth are essential to your child’s overall health and well-being, and regular dental visits are essential to maintaining healthy teeth. Aside from providing cleaning, exams, cavity treatment, and preventive measures like dental sealants, we also provide fluoride treatments. Periodic treatment with fluoride is an extremely effective way to keep your child’s tooth enamel strong and resistant to damage, ensuring that their primary teeth will remain healthy and bright until their secondary teeth are ready to come in. Fluoride is an interesting and very helpful mineral because it attracts other minerals and brings strength to our tooth enamel. At your child’s checkup, we can determine whether his or her teeth would benefit from a treatment with flouride. If we find that your child’s teeth could use a boost, we’ll recommend an easy and simple treatment. Fluoride and other minerals are a natural part of every healthy tooth, starting long before the teeth erupt. Healthy teeth are essential to every child’s overall health. Contact us to ask about fluoride treatments. Fluoride, along with other minerals, are a natural part of healthy teeth. They serve to keep the tooth surface hard and resistant to the effects of decay. However, these minerals can sometimes be less present depending on the food we eat and how often we brush and floss. Bacterial plaque on your child’s teeth can leach minerals from their surface, but can be slowed by regular brushing. Naturally over time, though, there can be continued weakening and damaging the teeth which contributes to the formation of hard, grey tartar. When fluoride and other minerals are found in the food and water your child consumes, they can replenish what has been lost to bacteria; but typically, food and water alone are not enough to maintain the optimal amount of fluoride. Occasionaly, a treatment with a fluoride-heavy foam can serve to help your child’s teeth have the optimal amount of flouride, which helps to give an extra degree of protection from plaque. We offer flouride foam in many flavors that is more appealing to children. Just a quick rinse after having the foam on their teeth for a few minutes and your their teeth will have a better chance of staying healthy. Oftentimes, one of our hygienists will recommend additional ways to keep your fluoride levels up between dental visits. These may include switching to tap water or using a fluoride-rich mouthwash at home. The only caution we give is to watch your child carefully when he or she brushes with fluoride toothpaste. Fluoride ingestion during tooth development can leave white spots on the teeth (fluorosis). As your pediatric dentists, Dr. Hines, Dr. Anderson, Dr. Norman, and Dr. Pagé will consult with you about safe levels of fluoride for your child’s smile. It is just as important to protect the fluoride in baby teeth as in permanent teeth. Baby teeth fulfill a vital role in the development of your child’s mouth, holding spaces for adult teeth, assisting in eating a healthy diet and learning to speak properly. 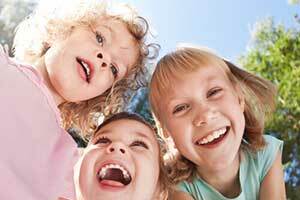 Having enough fluoride available is necessary for your child’s adult teeth to form properly. Keeping their baby teeth completely fluoridated helps ensure that the fluoride in their diet can go toward building strong new teeth. When your child visits our office, we will first clean and examine their teeth. If a flouride treatment is needed your child will be offered a choice of kid-friendly flavored fluoride which will be then be put in a special tray that will hold it against your child’s teeth. We’ll place the tray in your child’s mouth, then have them wait a few minutes while the fluoride soaks in. Once the time is up, we will remove the tray and your child will gently rinse out their mouth and be done! After a fluoride treatment, they should wait a few hours before eating or drinking. We can answer any questions you have about the treatment or about what to do afterward. At Hines Little Smiles, we’re always ready to help you keep your child’s teeth clean, healthy, and bright. If you haven’t yet scheduled your child’s next dental checkup, you can call our office to schedule a visit, or request an appointment online.